Take a walk along Jermyn Street in St James’s, London and you will encounter an intriguing 18th century façade. 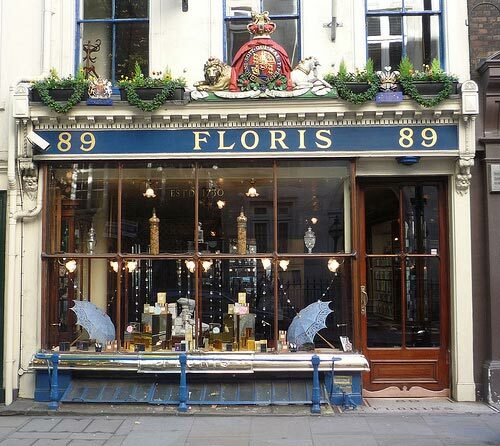 Here at number 89 is the Floris perfumery with much of the original shop front and interior fittings dating from 1730 when the business was first founded. Two hundred and eighty one years and seven generations later, and with the eighth and ninth now working in the business, this is still perhaps the most famous and prestigious purveyor of fragrances in the U.K.
Juan Femenias Floris left his native Menorca during the first British colonial period and, in 1730, settled in London. Apparently on seeing the typical British weather his first business enterprise was to sell umbrellas but surprisingly this soon floundered. Perhaps there was already too much competition? For some time Juan had been looking for something innovative and distinct. He moved into selling shaving products and combs but he soon realised that in the early 18th century perfume and fragrance was a very new concept and much sought after by the British “High Society”. His astute choice of business premises in the fashionable Saint James and especially Jermyn Street which was akin to Bond Street and his careful elaboration of fragrances soon brought him to the notice of the London aristocracy. His skill at using natural ingredients and the quality of his creations ensured the steady increase of highly placed customers and he soon became well known amongst them at a personal as well as professional level. He married Elizabeth, a young British lady, and together they continued the expansion of their clientele. Their son Robert Floris spent much time abroad sourcing the authentic ingredients for the perfumes whilst learning the trade. A later generation of the family (in 1863) Mr James Floris was delighted to receive a letter of thank you from Florence Nightingale after she had returned from the battlefield of Crimea, and during the time she was setting up the nurses training school at St.Thomas’s Hospital, extolling the virtues of their “nosegays”. The original of this letter is displayed within the shop today alongside the Royal Warrant, the Seal of Approval as official suppliers to the Royal Family when the Prince of Wales became King George IV in 1820. Today, over 190 years later, the British Royal Family still purchase perfumes and other fragrant items from the Floris company. Numerous well known personalities are known to have purchased from the Floris emporium, amongst them Sir Winston Churchill, Marilyn Monroe and Sir Ranulgh Fiennes. As well as much of the original and beautifully preserved façade, the interior still retains the solid mahogany Spanish made display cabinets purchased at the 1851 Great Exhibition in Hyde Park, and the fragrant and tranquil ambience of its founder Juan Femenias pervades. 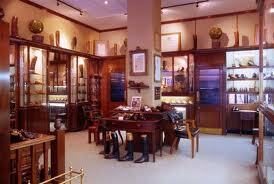 The shop at 89 Jermyn Street is still the heart of the business and is run by Juan’s descendants today. However in 1989 a new factory in Devon was officially opened by HRH Princess Diana and it is here that all their products are now manufactured. Into the 21st century and much of the business is now on line but the name Juan Femenias Floris and his vision lives on. So when next in London why not call in and see another Menorquin connection at 89 Jermyn Street, St. James.